SHB – Why do bees lock ‘em up? Some of the reactions of honey bee workers to the small hive beetle (SHB – Aethina tumida) are very curious. SHB is a serious pest of honey bees and, where the beetle is present, Apis mellifera beekeepers are having to learn how to help their bees cope with it. Native to sub-Saharan Africa, SHB was first seen in North America in 1996, Australia in 2002, and in Europe – southern Italy – in 2015. Once established in an area, SHB has proved impossible to eradicate. SHB invades colonies creating a disgusting mess of fermented honey, eggs and larvae. They roam the hive and the females will lay their eggs in cracks and crevices. 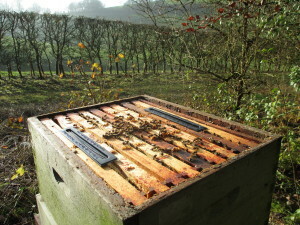 Beekeepers can place a Beetle Blaster trap between frames in a brood box to act as a sentinel or as longer-term protection. In sub-Saharan Africa, the African bee, Apis scutellata, will often simply abscond and start a new nest elsewhere leaving behind the horrible mess created by the pest. The western honey bee, Apis mellifera, is less likely to abscond. If the bees don’t abscond, what then? Some curious habits have been observed. Workers have been seen feeding SHB – perhaps fooled by some pheromone emitted by SHB. 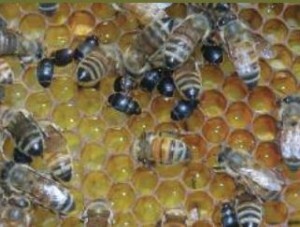 A more effective honey bee response has been to chase the beetles around the nest to herd them into corners where the beetles are then imprisoned behind a wall of propolis. But here is the very curious part: the bees don’t just leave them there to die; they often make small windows in the propolis jail walls through which they feed the beetles! The beetles cannot escape but they are fed. SHB seem to be able to trick some workers (but not all) into feeding them. No-one quite understands why. Meantime, stingless bees (Trigona carbonaria) are more ruthless in their treatment of SHB. They coat invading beetles with a lethal mix of resin wax and mud. No further treatment is required! See also: Robin Moritz and Robin Crewe, The Dark Side of the Hive, OUP, 2018.